Friends and family members mourn victims of DusitD2 complex attack at Chiromo Mortuary in Nairobi on January 16, 2019. 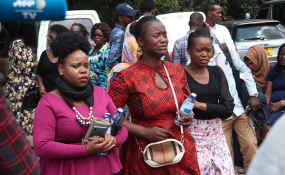 Families of the DusitD2 Hotel terror victims bore the agony of mixed-up details amid delayed and scanty information from the authorities as they camped all day in sweltering heat at Chiromo Mortuary yesterday to identify bodies of their loved ones. Dread, anxiety and despair were rife as families waited to identify bodies of their relatives. Others visited the facility to register details of their loved ones who were reported missing since the attack on Tuesday evening. Kenya Red Cross and the National Disaster Management Unit conducted the exercise. The list of missing persons was a guarded secret as officials did not want to disclose information to the media. For more than eight hours, families of those who had been confirmed dead were taken through counselling services and later allowed to view the bodies, most of which had gunshot wounds. The family of Jeremiah Mwangi reported him missing when they learnt about the attack on Tuesday. Mr Mwangi worked with Cellulant Corporation headquartered at 14 Riverside Drive. The family said officials had confused his name with another victim of the attack. After a long day of waiting, the family was given two bodies from which to identify their kin. After positively identifying him, the relieved but grief-stricken family left to prepare for his burial. Other families were asked to produce photos of their loved ones, even after sharing details of the missing persons with Kenya Red Cross the day before. Some of the families who could identify their loved ones were not allowed to view their bodies, as some of them required reconstruction. The families were asked to return to the mortuary this morning for the exercise. Meanwhile, attempts to get information from government officials present were futile. No senior official from the National Disaster Management Unit was present at Chiromo Mortuary to address the media. Queries were directed to the head office."